Anyone who paid attention in GCSE Geography will be aware of the concentric circle model of a town, with the CBD in the centre and the ‘commuter zone’ around the outskirts. Each zone has its own advantages and disadvantages for why people might want to live or work there. The same model can be tenuously applied to the proximity of pubs to my workplace (situated bang in the middle of pub-saturated Fitzrovia). A. Less than 2 minutes walk: the pub is so full of colleagues you may as well still be in the office. And they all probably get paid more than you do. The expensive pub is also likely to serve rubbish ale (if any) and will normally have few seats (let alone empty ones) – but its proximity means you can arrive at 12.01pm and nab the booth in the corner. It will have patio heaters on the pavement outside. B. 2-7 minutes walk: irritating colleagues may be avoided with careful planning, although this often involves conspiring with trusted team members who will then angle to join you for a pint or three. Seats generally available if you arrive before 12.30pm but watch out! Is that the executive director of marketing sat over there in the corner? C. 8-20 minutes walk: likelihood of colleagues interrupting your lunchtime rant about the uselessness of all spreadsheets is low. However the window of drinking time is drastically reduced, especially factoring in the inevitable post-booze drop-off of Powerpoint Enthusiasm which can make the walk back very slow indeed. D. Public transport necessary: For obvious reasons this sector must be visited for post-work drinks only. Thankfully the target pub has a zero probability of colleague attendance and it is safe to start moaning about ridiculous HR initiatives. E. More than 40 minutes on public transport: this will be the Wetherspoons near your parents’ house. It’s fairly easy to deduce that the ideal lunchtime pub zone lies on the boundary of B and C, and I am lucky enough to have a proper Escape Pub 7.5 minutes from my desk. 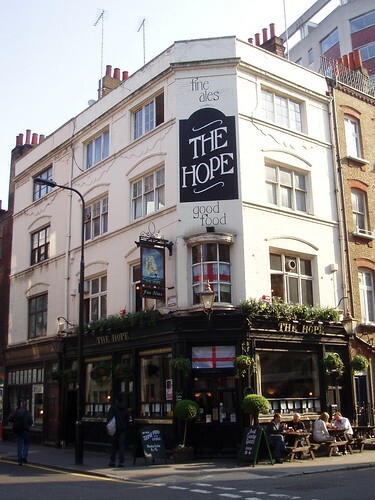 Tucked away behind Goodge Street station, The Hope has served me countless medicinal G&Ts, soothing pints of Tim Taylor’s and highly necessary Sausages of the Week. It has seen me change out of my (unsuccessful) interview suit in the loo and provided a sane environment to catch an hour of the French Open. Most importantly there’s a massive clock behind the bar that tells me when it’s 1.52pm and time to drink up. As the Hope has been my default ARGH WERK NOES pub for the last four years, I am genuinely saddened that it has suffered from a run of bad luck of late (through no real fault of the owners). One autumn evening this year we arrived to find the only beer available was cooking lager and bottles from the fridge. Even the Guinness was off! I hope The Hope will sort itself out in 2010. It has to be said that a large degree of the Hope’s success lies in its placement on the cusp of Zone B & C for about eight of us who work in the hinterlands of Fitzrovia and Bloomsbury. One of my favourite things about the Hope is it being a small pub, you always believe you have no chance to get a seat, especially as the outside is always full of kerbside vertical drinkers. But they are camouflage, you can always get a seat inside. But yes, sort out the beer and sausage problem please! I don’t think I’ve ever actually been in this one, despite working about 5 minutes away. Yes. Good pub. Good beer. And I remember pairing my phone with the Bluetooth card terminal and feeling like a genuine l33t haxxor, not that I did anything of any use with it.